You are here: Home » Our Technology » Why Choose CleanWorld AD? CleanWorld closes the loop on organic waste. One of our most important advantages: the productization of our monitoring and control systems. 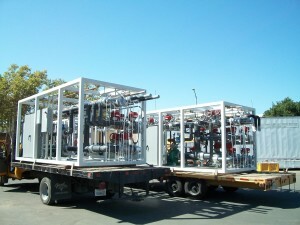 These fit in a rail container, are scalable, and pre-manufactured off-site. CleanWorld’s BioDigester is a thermophilic, high-rate, high-solid digestion system, with a three-stage design. It is especially engineered with food waste in mind, including agricultural residues, commercial food processing waste, and restaurant and supermarket food scraps. High-solids: CleanWorld’s BioDigesters efficiently digest a high-solid waste stream (up to 50% solids) without requiring substantial preprocessing and with minimal added water. The system can handle de-packaging and sorting, so organic waste streams that include cans, bottles, plastic-wrapped foods, and other contaminants can be used. 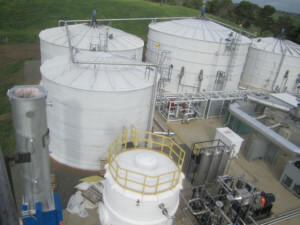 High-rate: CleanWorld’s proprietary high-rate digester design uses continuous—rather than batch—processing, allowing for rapid waste throughput. This technology has a higher organic loading rate, shorter hydraulic feedstock retention time (approximately 20 days), and a longer solids retention time to maximize bacterial populations and solids digestion in the system. High-rate processing reduces retention times by up to 50% over other systems, which means smaller tanks, a smaller system footprint, and lower site costs, allowing for economical applications in a wide range of industries. 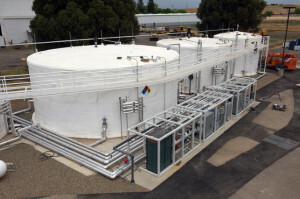 Taken when the Sacramento SATS BioDigester first opened: this project is negative carbon! Thermophilic: CleanWorld’s AD systems operate at thermophilic temperatures (122-140º F), in contrast to most AD systems, which operate at mesophilic temperatures (86-104° F). Operating at higher temperatures results in faster processing and reduces the size of the digester required. In addition, it destroys pathogens in the waste, making the residual materials safe for use as compost and organic soil amendment products. Energy usage: The low parasitic load of CleanWorld BioDigesters increases system energy efficiency in comparison with traditional power-hungry, high-liquid AD systems. The tanks and pipes are well insulated to minimize heat loss. In most cases, our digesters only require a small fraction of the heat and electricity produced to support the digester’s parasitic load. Construction: CleanWorld’s AD design combines the use of low-cost manufacturing and assembly techniques with a standardized, modular design that makes possible economically viable AD systems. Simplified assembly, reduction of labor, and the elimination of complicated on-site construction minimize up-front costs and speed construction. A CleanWorld BioDigester can be operational in as little as four to six months. The modular design also improves serviceability and enables easy scale-up when waste processing needs increase. Monitoring: Advanced instrumentation and control systems allow remote monitoring and control of the digester by PC, tablet, or smartphone, improving operational efficiency while reducing staffing needs and operating costs. The system provides real-time data trending; historical data is collected as well and analyzed to produce reports for monitoring system performance and detecting trends.